Shengyu Mu, Ph.D., assistant professor in the Department of Pharmacology and Toxicology, and his colleagues used innovative techniques to shed light on how immune cells in the kidneys can contribute to the development of salt-sensitive high blood pressure. Feb. 8, 2017 | Feb. 8, 2017 | A University of Arkansas for Medical Sciences (UAMS) researcher has shed light on the role of immune cells inside the kidneys in the development of salt-sensitive high blood pressure, publishing his findings in Nature Communications. 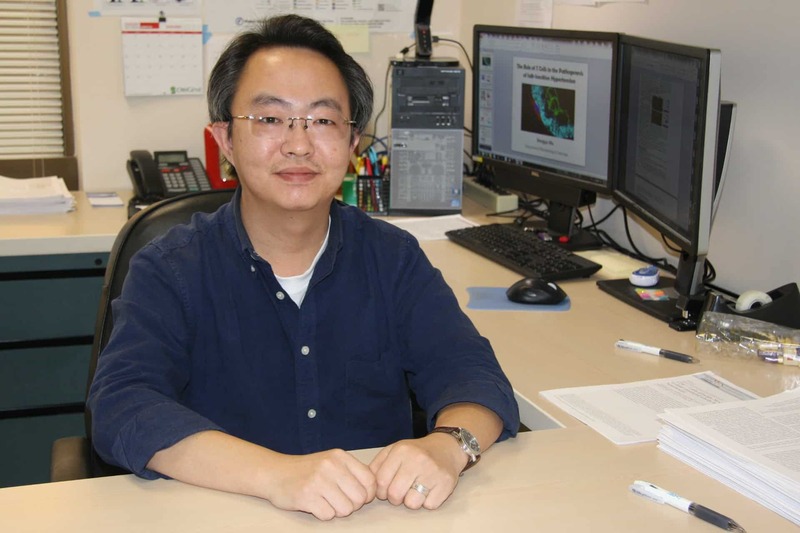 Shengyu Mu, Ph.D., assistant professor in the Department of Pharmacology and Toxicology in the UAMS College of Medicine, and his colleagues used innovative techniques, including super-resolution microscopy in UAMS’ Digital Microscopy Core, to illustrate at cellular and molecular levels that activation of immune cells in the kidneys can result in salt-sensitive high blood pressure, which is a form of high blood pressure that reacts directly to salt intake. 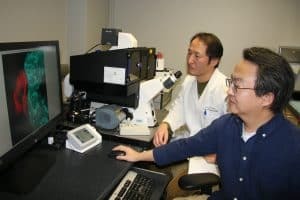 From left, Sung W. Rhee, Ph.D.; and Shengyu Mu, Ph.D., of the UAMS Department of Pharmacology and Toxicology review images taken by super-resolution microscopy in UAMS’ Digital Microscopy Core. Specifically, Mu’s work uncovered the interaction of a particular type of white blood cell with kidney cells. Scientists suspected that these cells – T lymphocytes, or T cells – played a role in developing high blood pressure but scientists were not sure how. Mu demonstrated that too many T cells in the kidneys might be the cause of salt sensitivity of high blood pressure. A major subtype of these T cells interacts directly with – and actually touches – the cells located in the area of the kidneys that reabsorb salt. This process enhances sodium chloride absorption in the kidney, thereby impairing the function of the kidneys that filter out excessive salt, consequently leading to salt-sensitive high blood pressure. “Dr. Mu is doing important work and we are thrilled to have it recognized with this publication in the prestigious journal Nature Communications, which is an acknowledgment of his diligent dedication to improving our scientific understanding in this area,” said Nancy J. Rusch, Ph.D., professor and chair of the Department of Pharmacology and Toxicology. Before coming to UAMS in 2013, Mu received his medical degree from TianJin Medical University in China and a Ph.D. from the University of Tokyo in Japan. Salt-sensitivity and high blood pressure have been Mu’s area of research for his entire career. Previously, his work has been published in Nature Medicine and the Journal of Clinical Investigation. He recently received the New Investigator award and the Research Recognition award from the American Heart Association and the American Physiology Society for his contributions to research. Mu is preparing to publish additional findings from this round of research and is writing grants for follow-up pursuits. He would like to explore how exactly the T cells and kidney cells are binding together. “I’d also like to study the ‘why’ behind the amplified effect of this binding of T cells and kidney cells that causes retention of salt in the body. We all have these cells, so what causes this amplified effect in people who get salt-sensitive high blood pressure?” Mu said. Additional authors on the paper from UAMS include Sung W. Rhee, Ph.D., associate professor in the Department of Pharmacology and Toxicology; postdoctoral fellow Yunmeng Liu; and technicians Tonya M. Rafferty, Jessica S. Webber, Li Song and Beixiang He. The work was funded by a Beginning Grant-in-Aid from the American Heart Association as well as UAMS Foundation Fund and departmental support. The Comprehensive Microscope Imaging Center was constructed at UAMS in 2011 and houses UAMS’ state-of-the-art microscope technologies under one roof. Nature Communications is a leading open-access multidisciplinary journal that is part of the Nature Research portfolio of products and services across the life, physical, chemical and applied sciences, including journals, online databases and researcher services, which are dedicated to serving the scientific community. The flagship publication Nature was founded in 1869 and is the leading weekly, international scientific journal.